Age: Far too old to be spending so much time playing a fantasy-themed digital collectible card game. I only know of one Eternal player who is older than me confirmed, and not by much. I’ve met maybe one or two others that are close-ish in age, but still younger than I am. I have an 8 year old daughter myself, but there are people in my age group who are (young) grandparents. That makes me PapaCapricorn for a reason. Birthplace: I was born in Cleveland, OH and have not been back since I left at the age of 7. SooNo told me a bit about what that city is like now, and I’m sure I would hardly recognize it. Most of my life I have lived in New England. Most Notable Eternal Achievement: I’ve been asked if I am the first Eternal player to reach a faction level of 100, which I did back in May for Shadow. Honestly, I’m not aware if there was another player before then, but it wouldn’t surprise me. Since then I’ve also hit level 100 in Time. And as far as I know, no one else has reached level 100 in two factions. The fact that I’ve only been playing for about 9 months gives you an idea how many hours I’ve put in during that time. It’s kind of ridiculous actually. I’m also currently at 70 for Primal, 57 for Fire and 52 for Justice so you can tell I have leveled up unevenly. Highest Chapter Ladder Rank: More so than the faction levels, I am personally most proud of another achievement which is maybe less unique – but I was pleased to reach Rank 15 with my own TPS brew back in Chapter 17 (April 2018). That was part of a streak where I hit top 100 several months in a row, and usually made masters in both ranked and draft. It was around then that I started to spend more time developing Shiftstoned than playing. So, my Masters ranks haven’t been in the double digits for a couple of months now. Regrettably, I have not made any impression worth mentioning on the tournament scene, unless you want to count an unexpected first-place finish at an early Kaelari Tuesday Night Eternal event where I two-and-0’d both LightsOutAce (on stream) and Batteriez. The timing of competitive events makes it tricky for me to participate as often as I’d like. So, I try to find other ways to be involved. 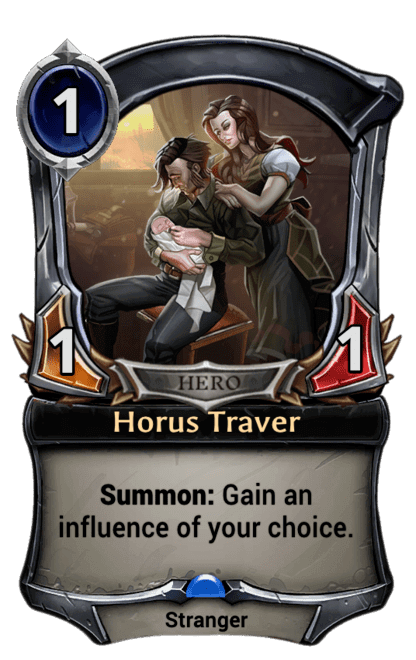 Playing Since: I was relatively late to the party, beginning in November 2017 – a couple of months into the Tales of Horus Traver era. The story and gameplay had me hooked immediately. 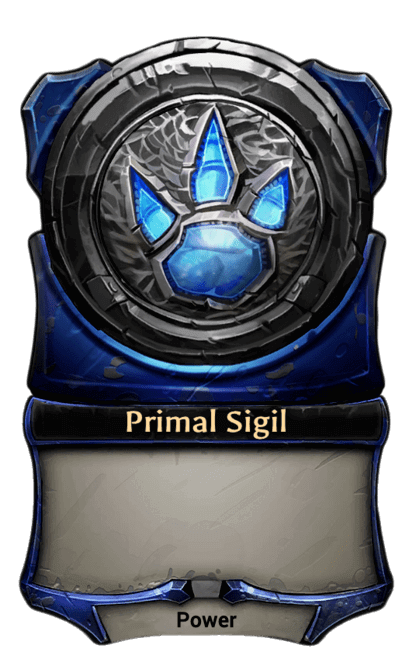 Favorite Deck Archetype: I prefer the bigger side of midrange, and have found that when I build the deck I want to play it is usually too slow to beat aggro, but not grindy enough to outlast control. 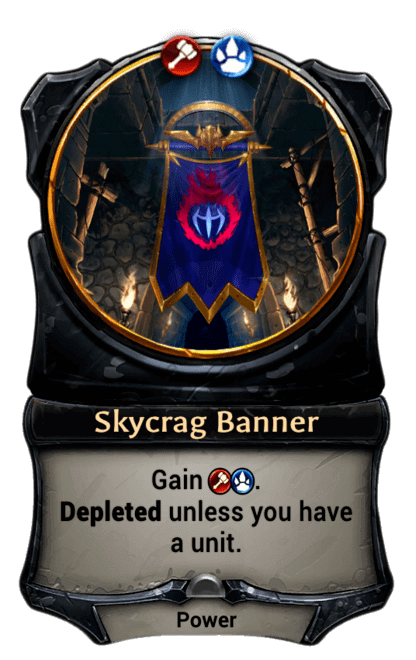 So, I’ll take a break and jam Skycrag Aggro for a while. Then tinker some more and try to figure out what works in the meta. 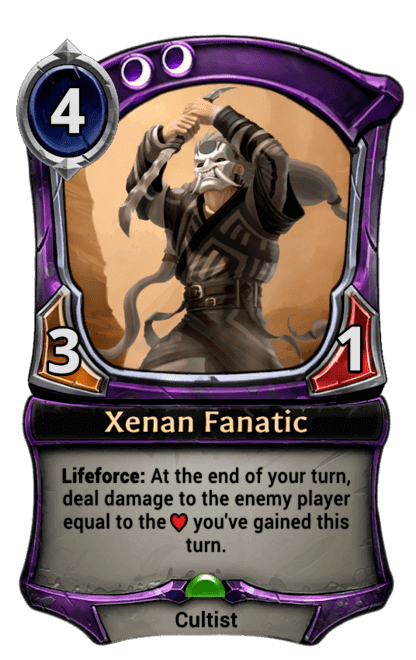 The first deck I remember saving up the stone to craft was Big Xenan, the one with Champion of Mystery and Mystic Ascendant. I was pretty excited about that list, although it appears to have been short-lived. Lately I’ve been laddering with Big Rakano while trying to make my own Xenan and TPS Brews work. 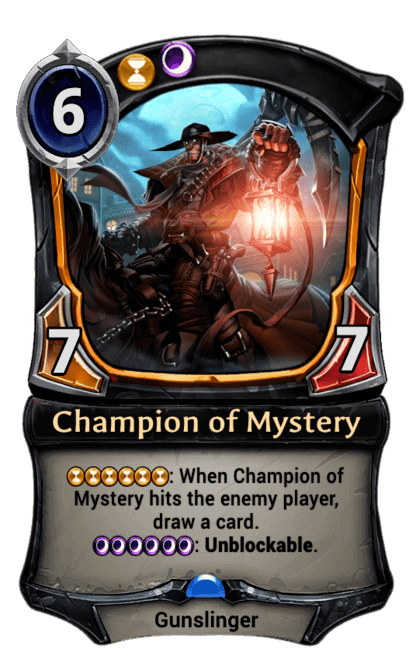 Favorite Card: Champion of Mystery was the first card to capture my imagination in a big way. Something about the glow from that lantern held by a rider on horseback – it’s just so atmospheric. 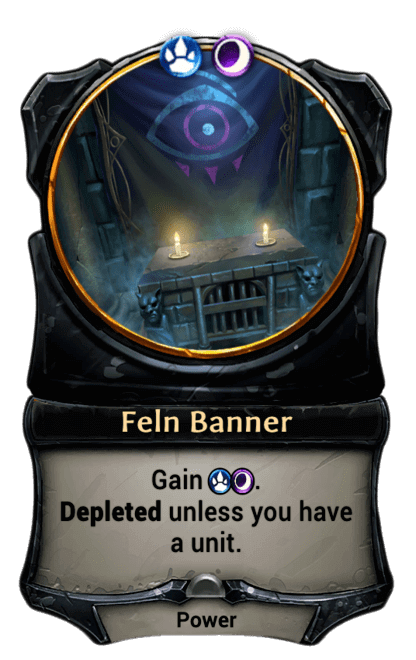 I also love Black-sky Harbinger, but not necessarily Feln. 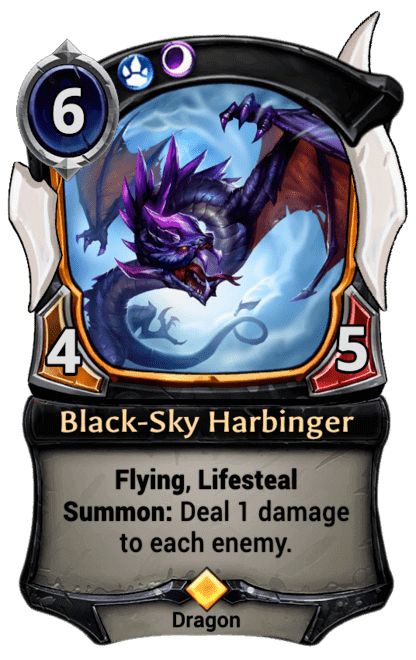 So, I’m usually trying to find ways to make Black-Sky Harbinger work in 3-color decks. 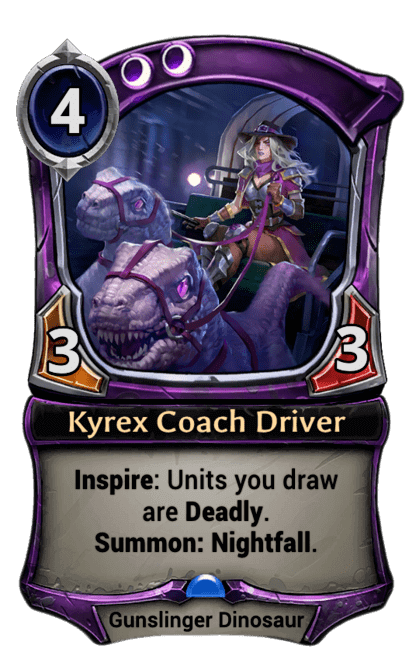 As unrealistic as it may sound, nothing would make me happier in Eternal than to reliably draw multiple deadly BSH’s in combination with Kyrex Coach Driver and some other tools, then finish the job with Champion of Mystery. 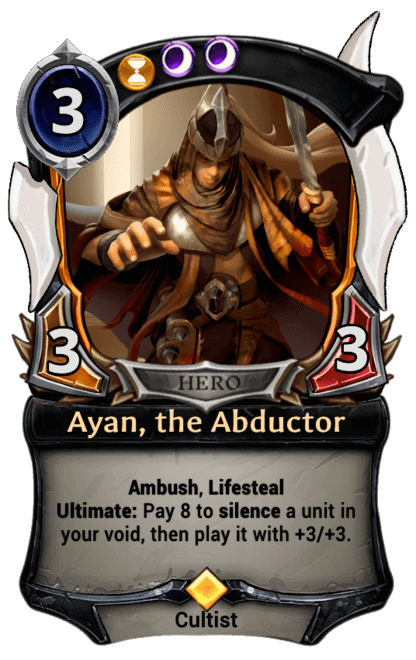 I also think Ayan, the Abductor is a really fun card. 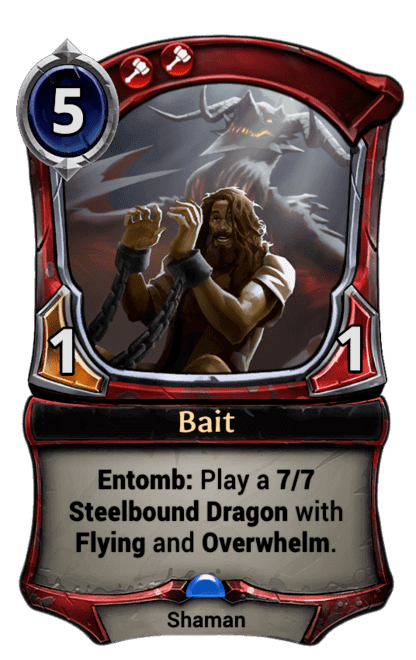 Most Disliked or Damaging Card in the Game: Usually I’m disliking the card that is being seen the most often and whatever is beating me at the moment. I understand that a big part of the fun of playing card games is imagining how to re-design cards and sort of play armchair game designer. 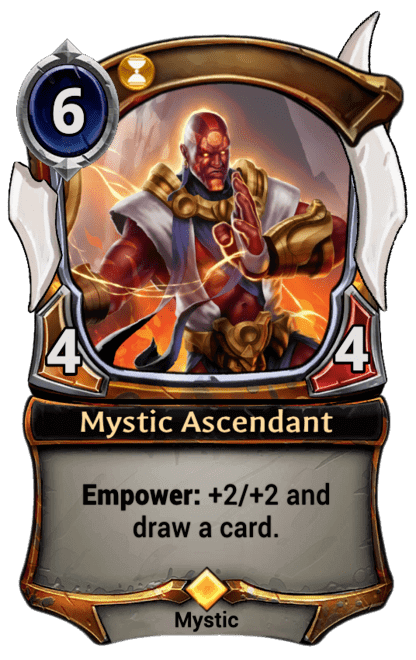 But for the most part, I think that Eternal is well-balanced. And if something starts to get obnoxious you can usually find the tools to counter it. 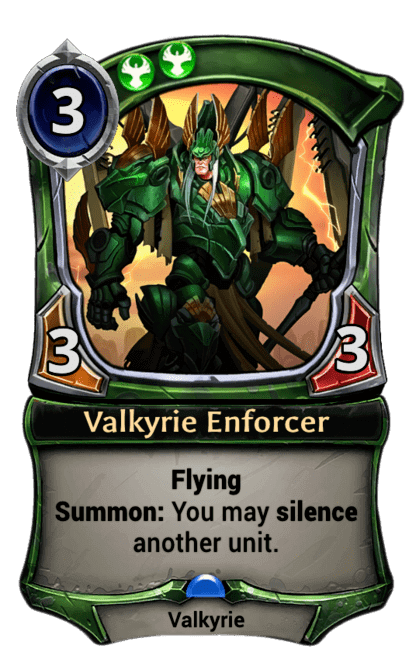 On a personal level, Valkyrie Enforcer is a card I don’t like to see my opponent’s play. But I’m always glad to draw it for my own hand. Silence effects in general tend to get my goat because I like to play flashy units with lots of keywords and card text. 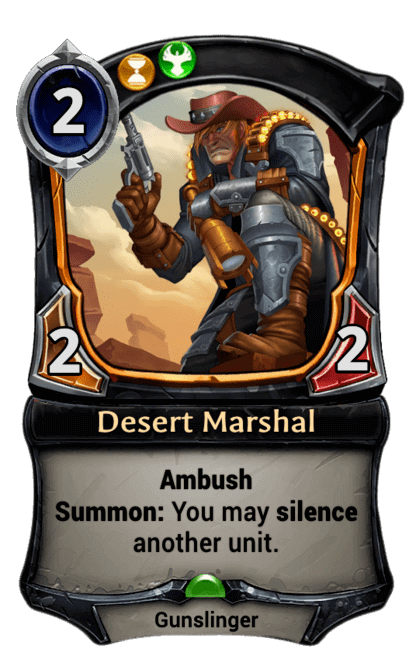 Desert Marshal makes me groan out loud. 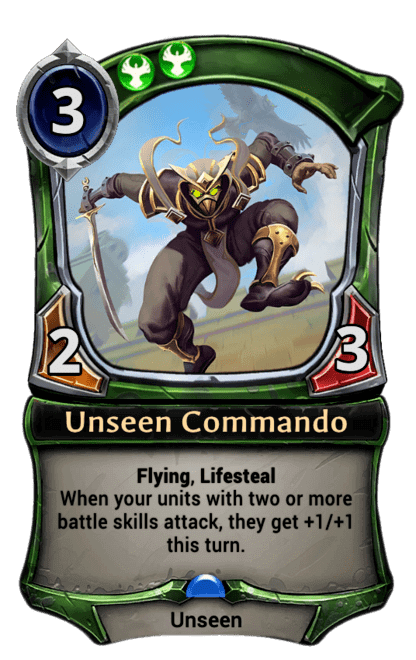 As far as balance goes, I was getting really sick of Unseen Commando during the late Dusk Road era. 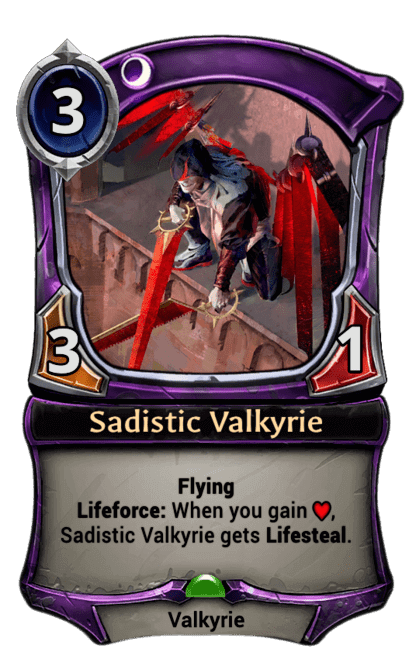 If you compare that card side by side with Sadistic Valkyrie, it demonstrates how Justice is overpowered in a lot of ways compared to other factions. If I were going to go on, I’d say that a lot of times I dislike a card for not necessarily the best reasons. For example, the audio design in Eternal is a big part of the experience for me. 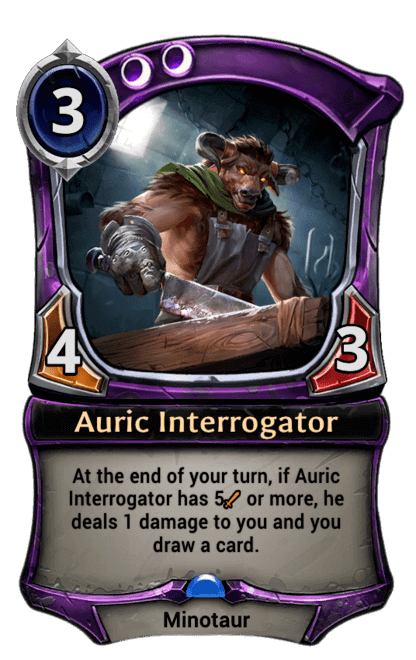 I can recognize that Auric Interrogator is a powerful card that would work well in a lot of decks I might want to play, but I can’t stand to hear that voice line over and over. 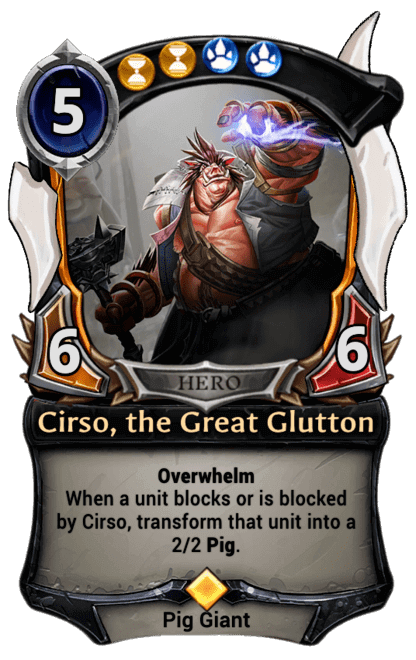 And man, Cirso is just gross. Eternal Wish: A big draw in Eternal for me is the storytelling, the lore. It feels very unique in a world of Middle Earth clones. And I love the Wild West flavor mixed in with the Middle Eastern elements and everything else. 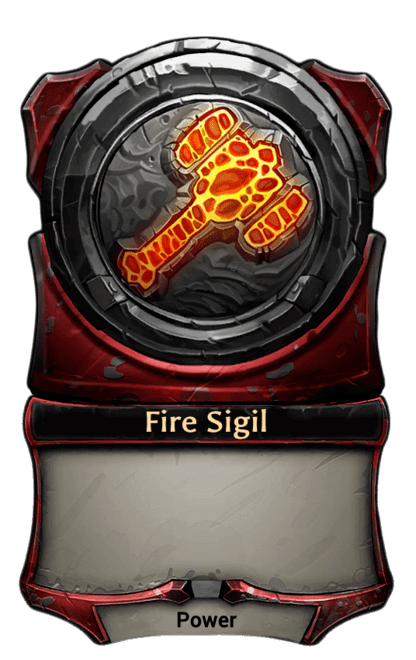 You can tell that DWD has put a lot of thought and care into this side of things. And I think they are really gifted at it. 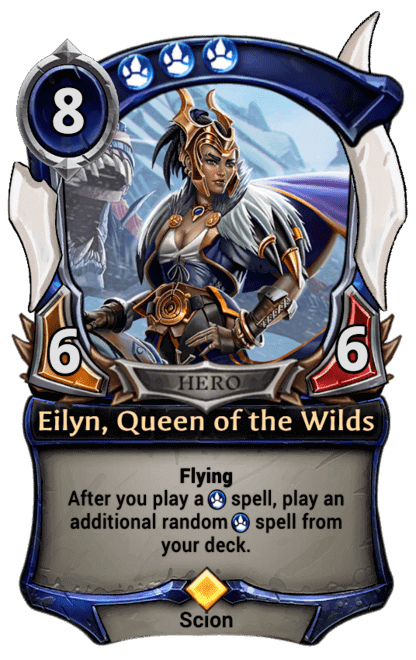 Unlike a lot of other card games that have spun off from another franchise, Eternal is starting out as an original CCG. It would be fascinating to see the world of Myria expand into other formats. If an MMORPG can become a card game, why not the other way around? It seems like a long way off, but I would definitely enjoy playing an Eternal RPG, watching an Eternal movie or reading an Eternal graphic novel. Personal Mantra: I’ve had to reevaluate a lot of my personal beliefs in the recent past, so in terms of a mantra to live by I need to find some new ones. But if we’re talking about games, I guess I would say that your FMR (Funmaking Rating) is just as important as your MMR. 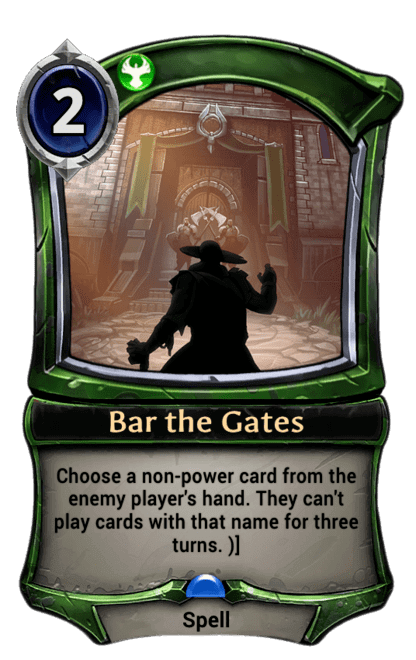 Like I said earlier, imagining cards is definitely a big part of the fun of games like Eternal. 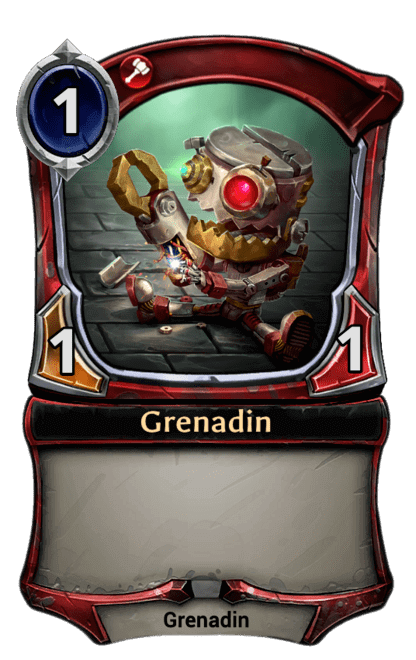 Most of the ones that I think of tend to be more flavorful rather than something the game actually needs. One idea was a series of quest-like cards that rewarded you for drawing a certain number of particular types. In this case it was a train robbery (Eternal needs more trains and boats). If you played the right number of cards of the right type, the payoff was something very similar to a card that actually exists now (Holdup). 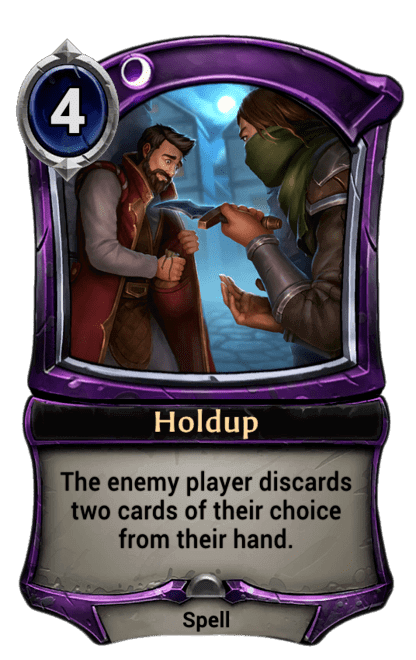 Except that you got to choose which cards your opponent discards. And the bigger pay-off included discarding cards from their deck too, not just in hand. 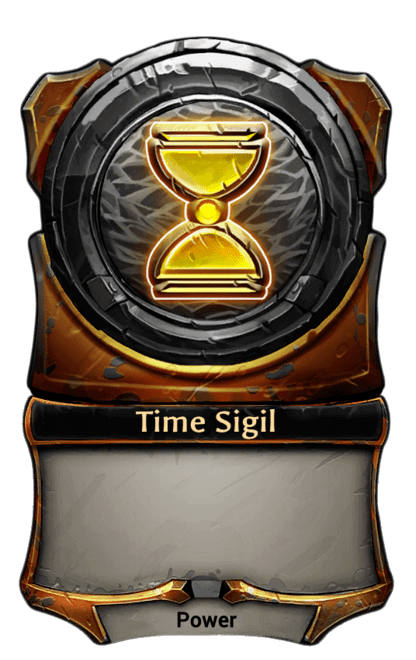 In terms of a card that I would actually find useful in the decks that I want to build, I’d like to a see a quality modal fast spell that gives you the option to either remove an early aggressive target or alternatively silence any enemy unit. MantidMan: PapaCapricorn, I think you are the first guest that is older than myself, which I have to say is refreshing. When you answer some of the upcoming topics with things I have not thought of I can chalk it up to life experience rather than you JUST being smarter than me like everyone else. I have to say, I am excited to have you join me. Your contributions across the board with content, tools, and involvement in EVERY medium I have seen are an inspiration. Before we get into Eternal talk, can you tell me a bit about your history, who is the Papa? How did he get here? 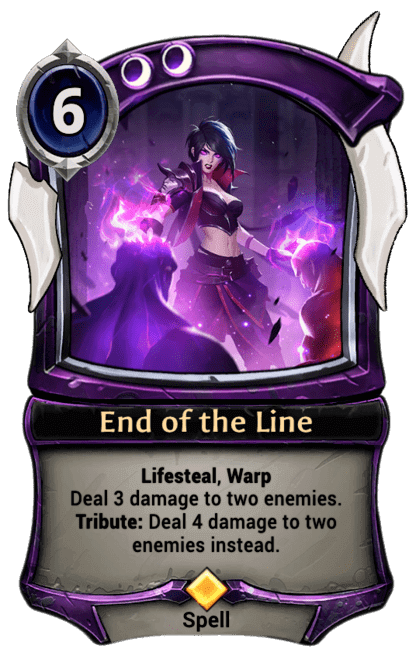 Like I was saying in the quickfire, Eternal had me hooked from the start. Recently in life, I found myself in a position where I had a lot of time on my hands. And I needed something to keep my mind active and busy while my usual activities were suspended. 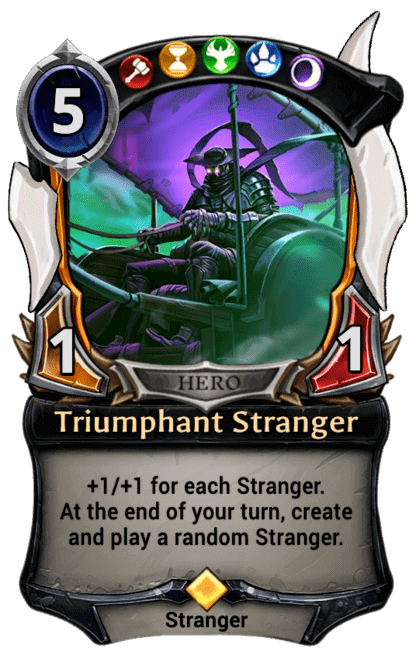 I had been playing some other digital CCG’s – you can probably imagine which ones – and Eternal just seemed like a whole other level, in terms of depth, polish, engagement and story-telling. What I didn’t expect was that there would be another side of it – an actual community of players that keep in touch, make friends, work on stuff together. That is probably what has continued to keep me engaged. Most of my real-life peers and family members would have a hard time understanding the idea that a community could exist around a video game. They might even consider it weird or deviant. But. I’ve found Eternal players to be a very welcoming, tolerant and friendly bunch almost exclusively. Sure, you get the occasional troll who will friend you just to be insulting, but even those interactions are kind of amusing. The rest of the bunch are a truly smart, interesting, and diverse group. And I hope it continues to be that way as the population size grows. I don’t really come from an MTG background, which I imagine is uncommon among Eternal players. I bought a ton of Magic cards when it first came out (and yes, I am old enough to remember its debut). I enjoyed looking at the cards, but weirdly I never played much. Mostly because I had trouble finding others who had the time to sit down and do it, with everything else going on. I’m not even sure I’ve ever played a complete game of Magic, and definitely not more than a few. The last time was a year or so ago when one of my nephews was trying to re-teach me, but I think he gave up. Digital CCG’s neatly solve that problem because there is always an opponent available 24/7 as long as you have a network connection. Plus, you can just kind of pick up and play, while the client keeps track of the rules and handles the math. So, you can spend more time playing and less time arbitrating or reading rule sets. MantidMan: I really enjoy talking to everyone we have on Trail Stories, the old guard from MtG, the transitions from Hearthstone, etc. 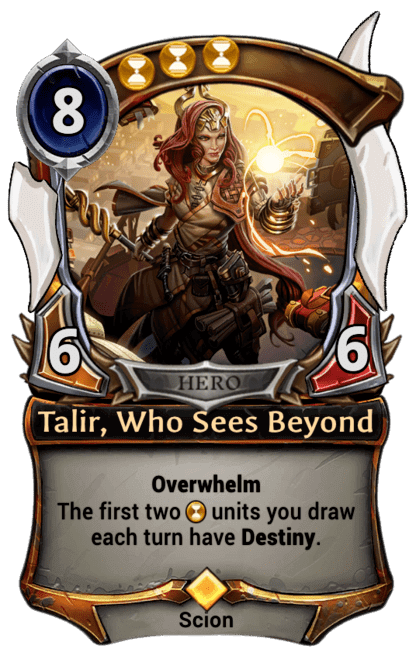 But when we delve into cards, I really like to hear from those that don’t have a storied history in card games, they seem to have a bit more of a ‘pure’ take on Eternal cards, instead of the parallel views from those other worlds. I’m going back to some of your answers from the quickfire, you seem to carry a lot of disdain for the archetype Justice is built into. 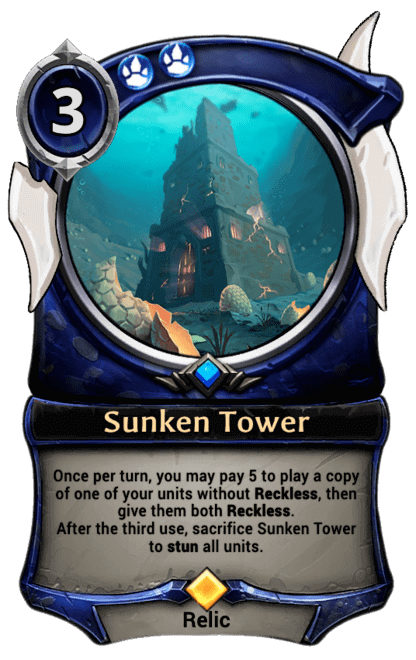 Is it more a personal dislike or do you think the designs are going down the wrong path of taking the game away from the opponent so to speak? PapaCapricorn: Everyone has their favorite cards and factions, and rivalries are part of the fun. I wouldn’t say that I have disdain for any particular color or archetype. On the contrary, I appreciate that a range of options is available, although I might have my personal preferences. 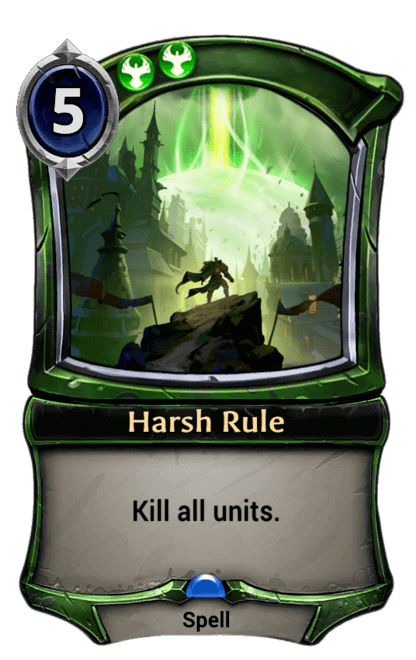 Most of the time, even when I’m hating on a card – I am glad that it exists. Because, every great story needs someone to root for and someone to boo. 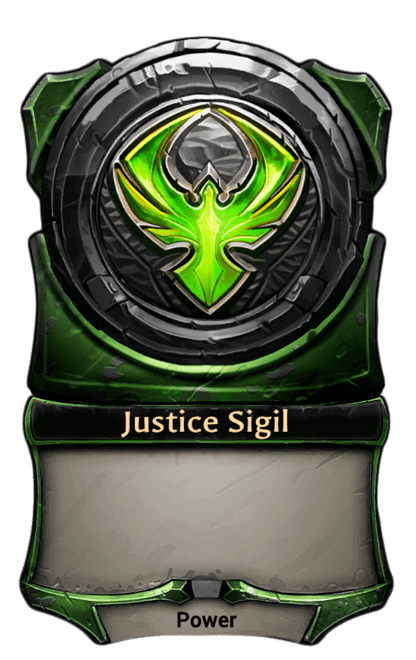 At the same time, I do think that Justice perhaps has access to just a few too many of the game’s most powerful effects – the best board clear in the game, Aegis, Relic Weapons, Silence, Hard Removal, Combat Tricks, Flying, Endurance, etc. – while having fewer weaknesses. And by nature, I suppose I’m sort of anti-authoritarian, so it makes sense that the so called “Fun Police” (silence effects) of Justice would get under my skin. Despite what Phoenixton might think, Rolant and his mustache are not necessarily who I want to be partying with. 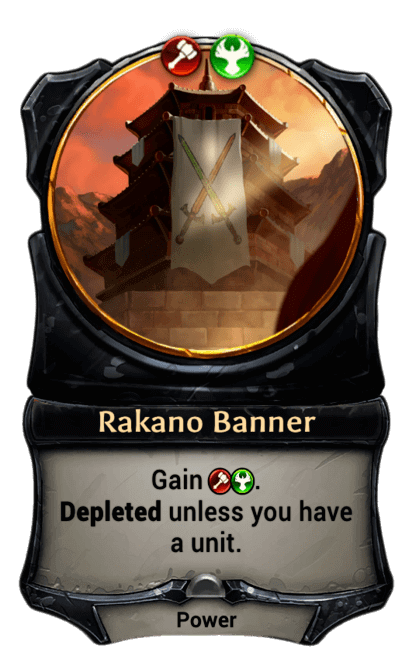 Having said that, Phoenixton’s Big Rakano list is a huge part of the reason I even made it to Masters during the past two Chapters. So, I am working on boosting those Justice and Fire faction levels. 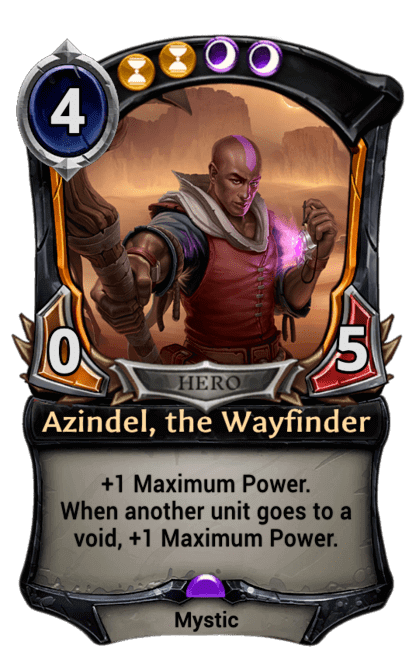 And from a flavor perspective – a lot of things in Eternal are left open-ended. There really is not pure good or evil in the game, it is more complex than that. That helps a lot to keep things interesting. Ultimately the only real problem is when a certain card or deck gets too repetitive. And I think DWD has done an admirable job of keeping things fresh. Even if I might not always agree with the specific changes. MantidMan: I like to think I follow the same thought process as well. 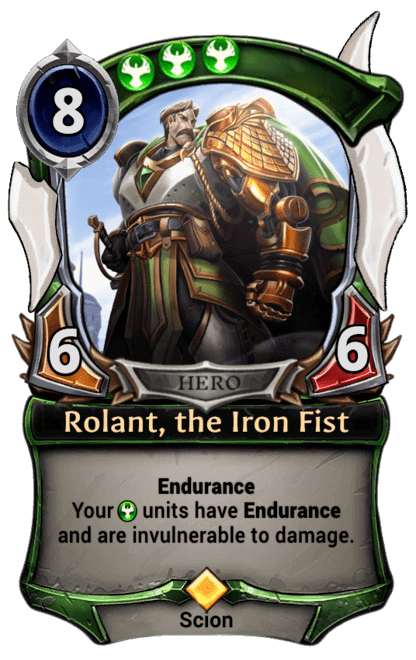 And while I disagree with you whole heartedly about Rolant, I do think you are right on point in the acknowledgment that DWD is doing a great job innovating and keeping things fresh. Now, you did hint at another topic, and I will take the bait and ask. What changes do you not agree with, and why? PapaCapricorn: Haha, you’re trying to stir the pot, aren’t you? Again, it is mostly about my personal preferences rather than feeling like decisions are “wrong”. 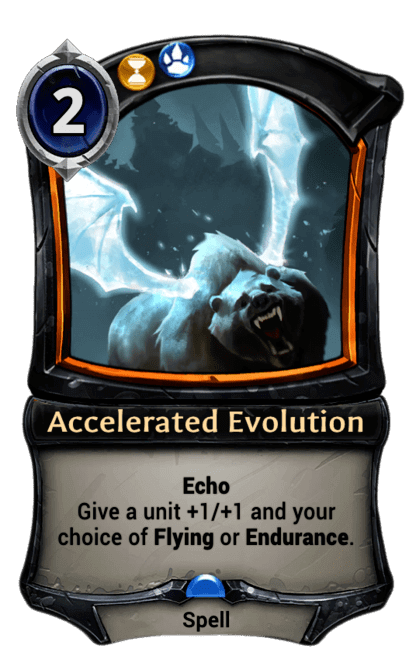 But for example, I was sad to see Accelerated Evolution get nerfed for the sins of other cards. 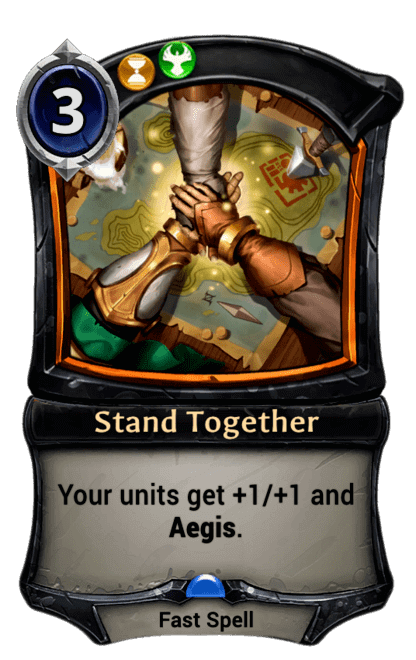 Evolution was pretty much a fringe card in constructed until Fall of Argenport came along, and I was surprised to see it be punished while Stand Together was left untouched. 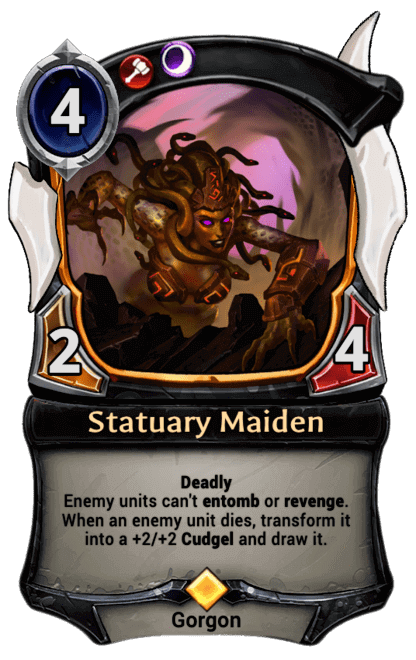 Looking back a ways, I was confused by the rationale behind the changes to Steward of the Past and Statuary Maiden. 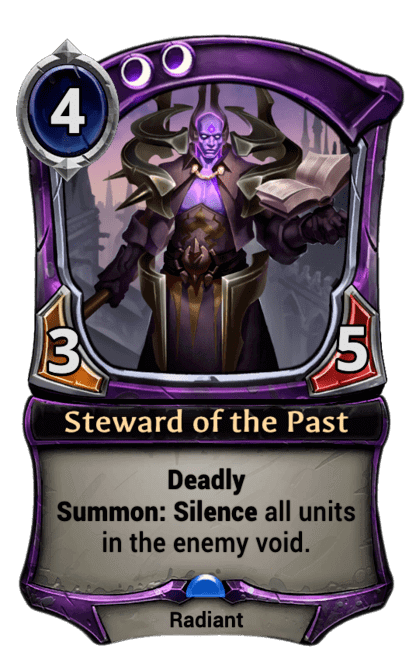 The notes said that the changes were made to better distinguish the two, but there are a lot of cards in Eternal that have similar effects to each other. It seems like water under the bridge now, but at the time I remember wondering if there was more to it. And like a lot of people, I miss the old Vara. Another one happened before I even started playing Eternal. 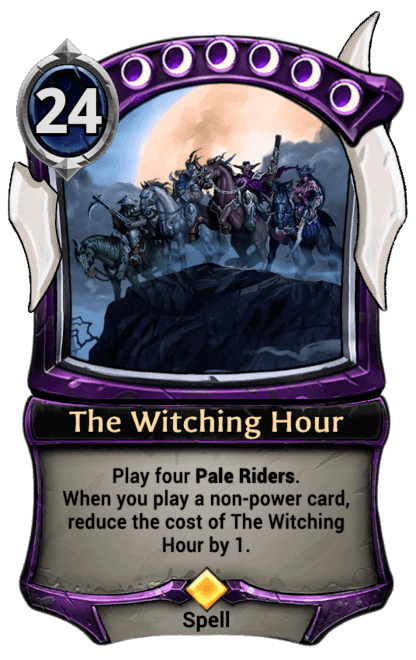 The Witching Hour is one of my favorite cards and I would like to have a chance to play it when it was more viable. MantidMan: See, I am not trying to stir the pot… there are plenty of people who enjoy seeing others’ point of views, and maybe we can affect some change in the thought process down the road by the powers that be. Who knows? That being said there is a lot of great stuff we can talk about as well! 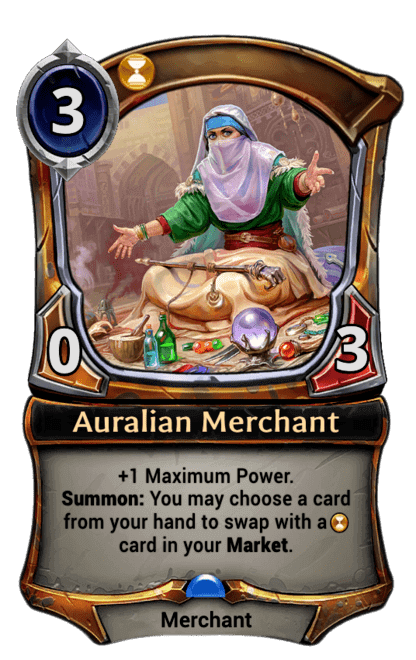 Let’s talk about your views on favorite cards. 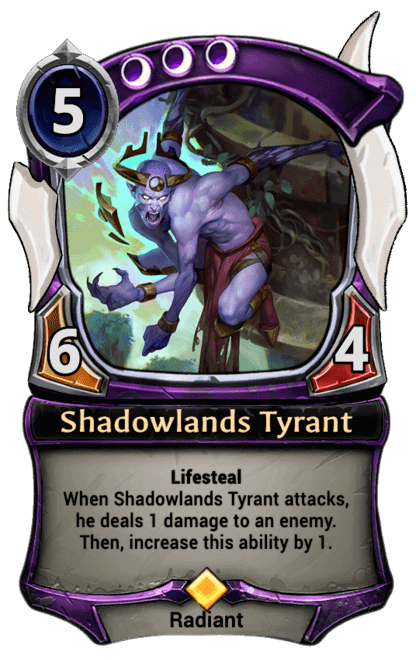 What draws you to cards like Black-Sky Harbinger, and dare I say maybe Shadowlands Tyrant? PapaCapricorn: I’d say Lifesteal is one of my favorite mechanics, and when you put it on a Flyer that has a powerful Summon effect, it just makes for a great package. Dropping BSH can lead to a powerful swing turn and enable some really exciting come backs when you are falling behind and low on health. 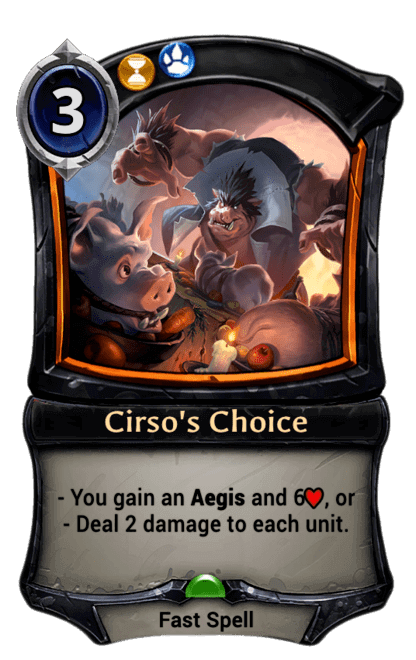 (Especially if your opponent has invested in a wide board of Grenadins) Flavor-wise I like how BSH is menacing but sort of majestic at the same time. The artwork is fantastic and the bat-dragon hybrid is intriguing to me. PapaCapricorn: It’s true, there really is a lot of depth. I think the Wild West theme is what grabbed me at first. Then the family dynamics between the different Scions – it makes for some riveting drama. From the start I was really curious about how Kaleb and Eilyn felt about each other. And we are just finding out some of that now. 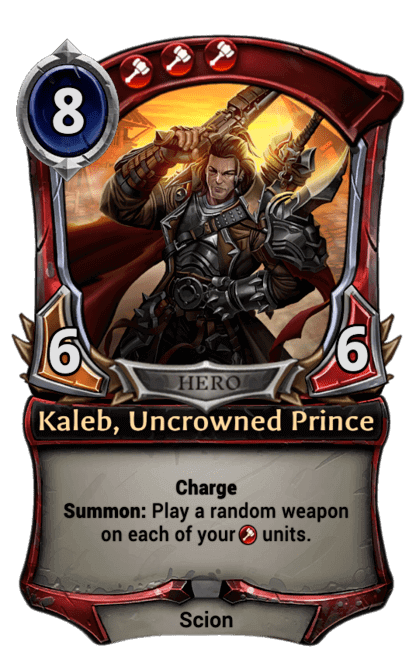 The mystery of Kaleb’s origin is also something I’ve always wondered about. And again, it’s only been recently that we’ve started to learn more about that. After that initial exposure, the story of Horus Traver is what really drew me in. 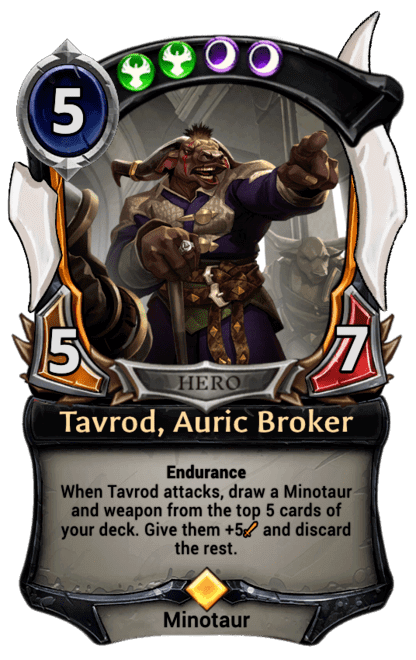 I find the scene where he is turned away from the Gates of Argenport (by Tavrod no less) to be one of the most poignant. And I can identify with his motivation for revenge (fueled by Azindel’s manipulation). The Strangers are fascinating too. They sort of symbolize this sense of personal empowerment, especially for ordinary folks. But at the same time there is something excessive and very creepy about them. The monotonous voices really freak me out sometimes when playing a Strangers deck. MantidMan: All great stories and pieces of lore that I also enjoy. What about in the future? Who would you like to see explored in the next campaign or chapter arc after we finish with Talir, Eilyn, and Kaleb? PapaCapricorn: Obviously, there is a lot more to learn about Vara and Azindel. Has the legitimate heir to the throne liberated herself from the suspicious mystic, and how? 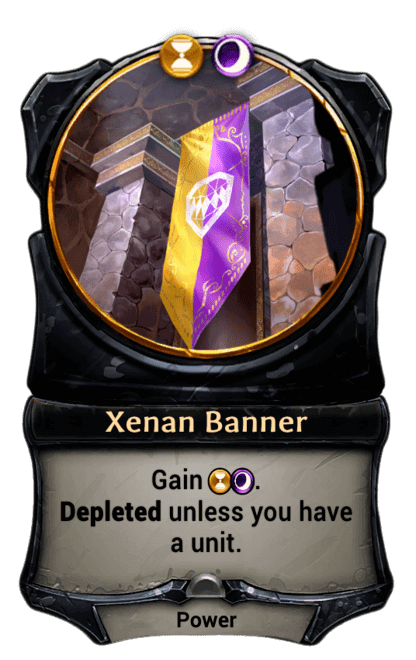 What did she discover when encountering the Xenan cult? 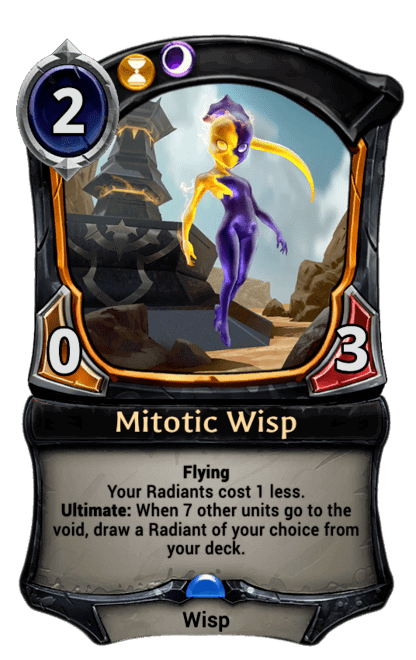 What exactly is their connection to the Wisps and Radiants? 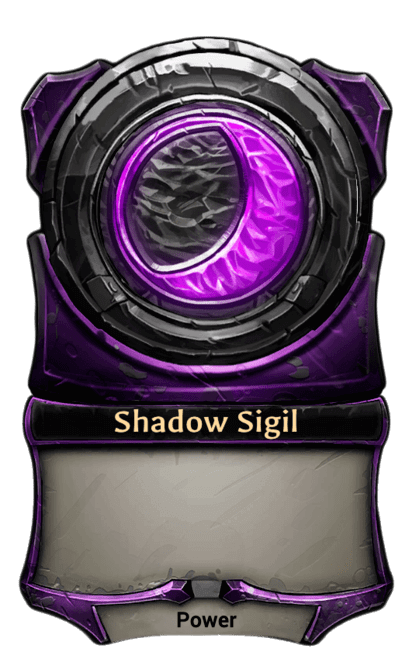 What are the Shadow Scion’s feelings toward her mother, Eilyn? 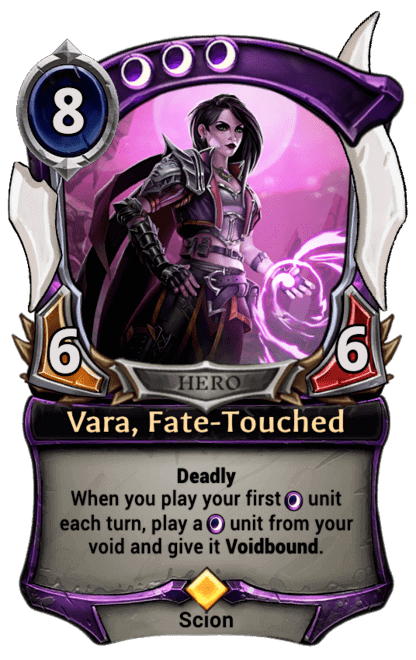 And most importantly: where in the Shadowlands did Vara go to get that sweet New Wave haircut? These are the questions that beg for answers. MantidMan: If I had to bet, I would say the next campaign will follow Vara, regardless of my desire to know about the amazing creature that is Cirso and his gluttony. Now for the last question, I usually just open up the floor for you to pitch yourself, your product, and your involvement in the community. But you, Papa, you are a special case. So, go ahead and take the floor and make sure you give me a bit of the history and development of Shiftstoned and especially your Power Calculator. As I mentioned earlier, Eternal has been a great distraction for me. And I found that extends beyond just playing the game. I began collecting some data to try and improve my decks and boost my win rate, and I started having fun visualizing these things. Initially when deckbuilding, I would just jam in the cards I wanted to play, click the “Add Power” button and be done with it. Building a Power base seemed like a chore. It reminded me of eating your vegetables – something that you do because it is supposed to be good for you, not because you want to. Since then I’ve come to realize how important it is to build a good Power base, and how it is directly tied to your win rate. On top of that, it can actually be one of the most rewarding parts of deck-building. And I wanted to help other players understand that. The key for me was to start looking at Power bases visually. Some people have assumed that I have a lot of math knowledge, but actually it is just the opposite. I had a hard time understanding the probabilities until I could see them on a chart. So, I built a simple prototype using online calculators and the graphing tools in a Google spreadsheet. Looking at things this way definitely made me a better player and made deck-building more enjoyable. I wanted to find a way to share that part of the experience with others as a way to engage. I have a background in visual design and interactive media. But what little programming knowledge I have is way out of date. So, I was very fortunate to come across an extremely gifted coder and math brain by the name of Apostatic. We started collaborating and he took my clunky prototype and turned it into something much more usable. On top of that he added layers of functionality I hadn’t even imagined were possible. For both the calculator and the Shiftstoned Calendar, we had a lot of input from some top players and well-known community members. It has really just been a fun way to interact with these different personalities, and try and provide some resources for a wider body of Eternal enthusiasts. Initial conversations with Stevercakes at EternalWarcry.com helped to get the ball rolling. AhornDelfin has been an invaluable adviser. TonyGeeee and Paradox were both great sources of feedback and support. Camat0 taught me a lot and helped to work out some of the bugs. Kaleos was an inspiration with her rigorous data analysis and patient explanations of hypo geometric principles. And just about everyone in TGP was an encouragement through their sheer enthusiasm and dedication to supporting the game. MantidMan: And where can we find all of the stuff you have your hands in? A number of player resources can be found at Shiftstoned.com. In addition to the Eternal Power Calculator, you’ll find the Community Calendar. 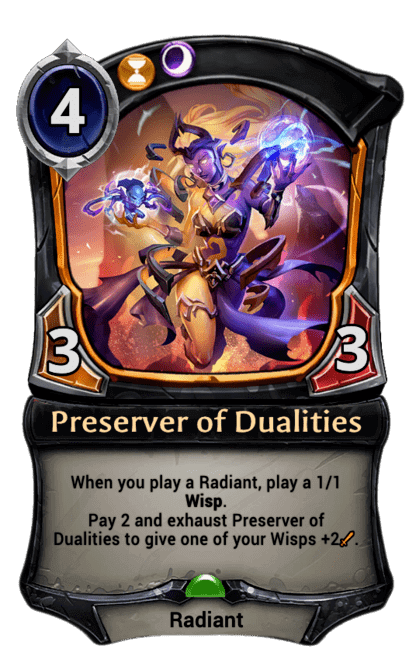 And a (semi-) weekly series of articles that use the calc as a launching pad to discuss a variety of Eternal-related topics, ranging from math to lore to community. The calendar was created after I found myself missing one too many registration deadlines because I would just plumb forget. So, I wanted to host a place where people could track all the different events that are happening – especially now that there are almost daily competitions or content releases going on. A link for tournament organizers and content creators to submit their own event is included too. So, I encourage anyone reading to contribute if they want to spread the word about a happening of their own. We are just two days short of having a daily competitive event every week. We have some more exciting things planned for Shiftstoned in the future, and I’ll take this opportunity to mention that if you are a coder or developer that is interested in helping out – please get in touch. The best way to reach me is on discord: PapaCapricorn#2915. Occasionally you’ll find me streaming from my phone on twitch. I have a pretty low-tech setup and no audio commentary. But I communicate with viewers via text and that can be fun. Lastly, I also blog at papacapricorn.com where you can find some of my personal experiences or observations in Eternal. MantidMan: It should be noted that you can also find Trail Stories on the Community Calendar, JUST SAYING! PapaCapricorn, it has been an absolute blast learning about you, your insights, and your take on the lore. You are a cementing figure in the community and I was honored to have you accept this invite and spend some time with you! Thanks so much. PapaCapricorn: The pleasure is mine MantidMan. I’m a big fan of both Unexpected Results: THE Eternal Podcast and Trail Stories, so it’s been a thrill for me to participate. Eternal, and games like it, bring people together and you GET that, so thank you my dude.